The Carpenters own and operate Carpenter Primary Healthcare, PLLC. The family practice, located at Methodist South Hospital Medical Office Complex, provides quality patient-centered preventive and primary health care. 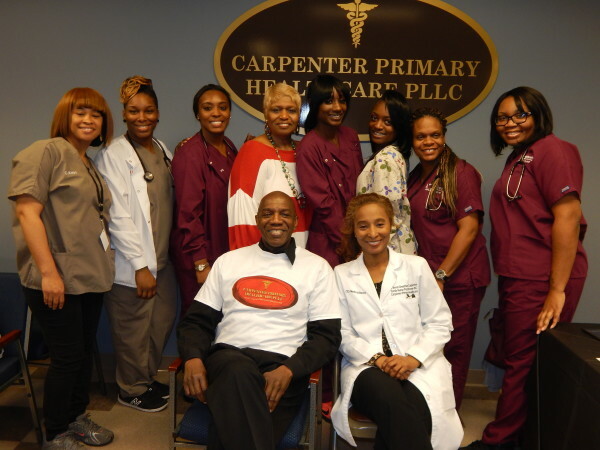 The Carpenters make sure their practice travels outside of the office as well – you can find them in the community occasionally offering free health screenings and discussing many topics connected to your health and well-being. On February 9th, 2015, this husband and wife team embarked on an entrepreneurial journey – they decided to open their own family practice and dedicate their lives to fostering good health and well-being in Memphis communities. Terrell Cheatham-Carpenter, DNP, APN, FNP-BC is a board certified Family Nurse Practitioner with 17 years of experience in family practice. Her nursing interest started at the tender age of 5 years old. While attending Westwood High School, she worked as an American Red Cross volunteer “candy striper” at VA Medical Center in Memphis where she was awarded the “Most Outstanding Youth Volunteer” for 1979, 1980 and 1981. After graduating from high school, she went on to pursue a BSN from Tennessee State University in 1987. She was employed by the Regional Medical Center at Memphis for 10 years as a staff registered nurse in various units such as medical-surgical, medicine ICU, surgical ICU, trauma ICU, and ER. Terrell received an MSN from the University of Tennessee Health Science Center at Memphis in 1997. She has worked in various clinical roles collaboratively and as a solo provider in areas of occupational health, family practice, home health, school-based health, community health, and endocrine/diabetes management. In 2007, she was awarded “Top 100 Nurses” in Shelby and Fayette County, and received a certificate by the Tennessee Nurses Association (TNA) for “Outstanding Nursing Achievement”. She was Director of Health Services at Fitzgeralds Casino for six years and later served in various administrative and academic settings that were inclusive of preceptor/mentorship, adjunct teaching positions, and project manager/liaison duties. In 2013, she received a Doctor of Nursing Practice (DNP) from Union University. Her published scholarly project was featured in the NP & PA peer review journal website http://nurse-practitioners-and-physician-assistants.advanceweb.com, focused on lifestyle modification of diet and exercise in Type 2 diabetes mellitus patients. Ken and Dr. Carpenter’s philanthropic endeavors include the donation of the Carpenter House, which provides quality and affordable housing for adult males living with Sickle Cell Disease. As a member of the Alpha Phi Alpha Fraternity, Inc., Carpenter serves as a co-chairman for “Project Alpha,” an annual collaborative-youth empowerment conference that focuses on sexual activity and relationships among teenagers. He also serves as a mentor with Big Brothers Big Sisters. As an Associate Professor at Southwest Tennessee Community College, Carpenter co-authored two laboratory manuals: Human Anatomy & Physiology I and Human Anatomy & Physiology II; authored Introduction to Human Anatomy & Physiology Laboratory Manual; and developed online and hybrid courses for Anatomy and Physiology (A&P) I and II and the A&P Student Tutorial, which offers a 24/7 online tutorial aimed at increasing student retention. He established the Natural Sciences Tutorial Lab and developed a Modular Based Format using Interactive Technology and Chromebooks to teach introduction to anatomy and physiology courses. Carpenter established the Dr. Martin Luther King Jr. Scholarship to assist students with tuition and textbooks. He is a member of the Human Anatomy & Physiology Society (HAPS) and a past board member of the Alpha Memphis Education Foundation (AMEF). Carpenter is the recipient of several awards, including the Farris Outstanding Faculty of the Year Award, the Instruction and Curriculum Development Award, the Outstanding Service to the College Award, the President’s Award for Community Service. He received both his Bachelor of Science and Master of Science degrees in Biological Sciences from Tennessee State University.